5:21 AM – Officer responded to HEB C-Store for a welfare check on children who were seen in the bed of a truck while the truck was in motion. Officer arrived on scene but only saw the children inside the vehicle while it was in motion. 5:54 PM–Officers responded to 18900 Blk. of N. Prairie St. for a welfare check on complainant’s brother. Officers spoke to owner who stated she had recently bought the house from complainant’s brother but does not know his whereabouts. 10:10 PM – While on patrol at 19300 Blk. of McDonald St. officers noticed a suspicious male at location. A 40-year-old subject was arrested for having an Active Warrant out of Atascosa Co. for Failure to Appear Org. Charge of Aggravated Assault with Deadly Weapon – Family. Subject was transported to Atascosa Co. Jail. 9:11 AM – Officer responded to Brush Country Real Estate for a report of illegal dumping behind the building. 11:03 AM – Officer responded to 18300 Blk. of Wisdom Rd. for a report of a verbal disturbance between a contractor and an employee. The employee was given a courtesy ride to HEB C-Store to arrange transportation. 4:01 PM – Officers responded to Pumphouse Carwash for a report of a disturbance between a customer and the manager. Customer left the premises without further incident. 4:18 PM – Officers responded to HEB Plus for a report of a two vehicle crash. 5:19 PM – Officers responded to HEB C-Store and talked to complainant in reference to an attempted assault. 8:49 PM – Officer responded to 16000 Blk. of White Cap Dr. and talked to complainant in reference to a harassment. 10:10 PM – Officers responded to 15000 Blk. of Railroad St. for a welfare check on a female on crutches walking in the middle of the road. Officer provided a courtesy ride home. 1:14 AM – Officer responded to IH 35 at Mile Marker 131 SB for a report of a pothole causing a traffic hazard. Officer searched the area, unable to locate. 4:22 PM – Officer responded to HEB Plus to unlock a vehicle. 5:15 PM – Officers responded to 15500 Blk. of Main St. to attempt a warrant service. The subject was not located. 8:00 PM – Officers responded to 15500 Blk. of Main St. to attempt a warrant service. The subject was not located. 2:38 AM – Officers responded to 18300 Blk. of Wisdom Rd. for a report of an alarm. It turned out to be a vehicle alarm going off. No sign of forced entry to the vehicle nor was it open. 7:50 AM – Officer responded to US Post Office to unlock a vehicle. 10:26 AM – Officer responded to 15800 Blk. of Lake Breeze to assist Lytle Vol. Fire Dept. with a fire alarm. 1:48 PM – Officer responded to Lytle Nursing Home for a report of a natural death. 2:00 PM – Officer responded to 14600 Blk. of Main St. for a report of a 911 hang up call. Officer contacted an employee, all was fine. 3:10 PM – Lytle Police was advised that a reported stolen 2005 Ford F350 from 12/13/18 was recovered by Wise County S.O. 6:04 PM – Officer responded to 19000 Blk. of N. Benton St. to assist Atascosa EMS. 7:16 PM – Officer responded to Church of Christ to unlock a vehicle. 7:47 PM – Officer responded to Whataburger to unlock a vehicle. 8:55 PM – Officer responded to IH 35 SB at Mile Marker 133 to assist Medina Co. with the search of a suspect who fled from Medina Co. Officer was unable to locate. 9:35 PM – Officer conducted a field contact on a suspicious vehicle at MC Storage. It turned out to be an individual storing items in the climate control storage. 9:50 PM – Officer responded to HEB Plus and made contact with individuals loading up potted plants. All was fine, items were paid for. 11:55 PM – Officer responded to US Renal Care for an alarm. 12:15 AM – Officer initiated a field contact on a suspicious vehicle at Best Western Plus. The occupants stated they were waiting for another party and were headed to San Antonio. No sign of criminal activity. 9:20 AM – Officer assisted Medina Co. S.O. SRO with escorting the Lytle ISD Power Lifting Team out of Lytle as they were headed to Abilene for a tournament. 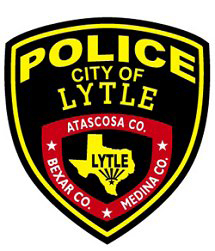 9:45 AM – Officer responded to the Lytle State Bank for damages to the front door. It was determined that the damages were from a tire that came off a vehicle on IH 35. 3:09 PM – Officer took a report at the PD in reference to a person who was defrauded out of $1,450 during a Craigslist transaction. 5:35 PM – Officer spoke to a complainant over the phone in reference to a civil matter. 11:20 PM – Officer responded to the Hacienda Jalisciense for an alarm. 1:10 AM – Officer checked on an abandoned vehicle in the 14500 Blk. of Main Street. 5:00 AM – Officer responded to the 15300 Blk. of Main Street to check the welfare of a person walking a dog. 9:02 AM – Officer responded to the 19000 Blk. of Live Oak Street for a natural death. 2:51 PM – Officer responded to the HEB Plus for a minor accident. 3:35 PM – Officer was flagged down at the HEB Plus and advised of a road rage incident that occurred on IH 35. 7:40 PM – Officer responded to the Bill Miller’s to assist a disabled motorist. 11:00 AM – Officer responded to the HEB C-Store to unlock a vehicle. 2:55 PM – Officer responded to the HEB Plus for a reported theft. Investigation determined that no theft occurred. 3:35 PM – Officer responded to the Days Inn in reference to a harassment incident. 11:30 PM – Officers responded to IH 35 at the Bexar County line to assist Bexar Co. S.O. with a horse in the roadway. 7:26 PM – Officers responded to the 15500 Blk. of Main Street for an unknown substance found after a subject left. The substance was seized as illegal narcotics.